The leading driver of the global anti-collision sensor market at the moment is the increasing number of vehicles on road, coupled with the increasing percentage of vehicular accidents. The growing scope of road accidents is prompting for the faster development of better anti-collision technology. The global anti-collision sensor market is also being propelled by the implications of the New Car Assessment Program (NCAP) in North America specifically. Advancements in sensor technology and its implementation in autonomous transportation system are also increasing scope with which anti-collision technologies can operate. The global anti-collision sensor market is also likely to be driven by the rising application of UAVs in military, scientific, commercial, agriculture and recreation. However, the high cost of anti-collision sensors is currently impeding the overall growth rate of the global anti-collision sensor market. The global anti-collision sensor market was valued at US$3.8 bn in 2015. The market’s revenue is expected to continue expanding at a CAGR of 19.8% from 2016 to 2024, eventually accounting for US$18.543 bn by the end of 2024. Europe is the leading market player in global anti-collision sensor market, owing to a large number of European countries such as Russia, Germany and Italy that are adopting automated transportation system in metro rail, and other vehicles. Adaptive cruise control has the leading share in this market. European car manufacturing companies such as BMW, Honda are incorporating this technology in their cars, thus broadening the market scope of radar and camera sensors. Aerospace and defense is the leading market in terms of end users as Russia, Germany make huge investment on defense products. Drones have been extensively used in this region thus increasing scope of anti-collision sensors. Asia Pacific is likely to acquire a significant market share as Japan and China are some of the important nations that contribute to the growth trajectory of anti-collision sensor market. Japan implemented autonomous decentralized transportation system and this increases the number of automated rail network in this country. China is just next to USA in terms of car population and adaptation to automation is the latest trend there. Hence, Asia Pacific region has substantial contribution in triggering the growth of anti-collision sensor market. 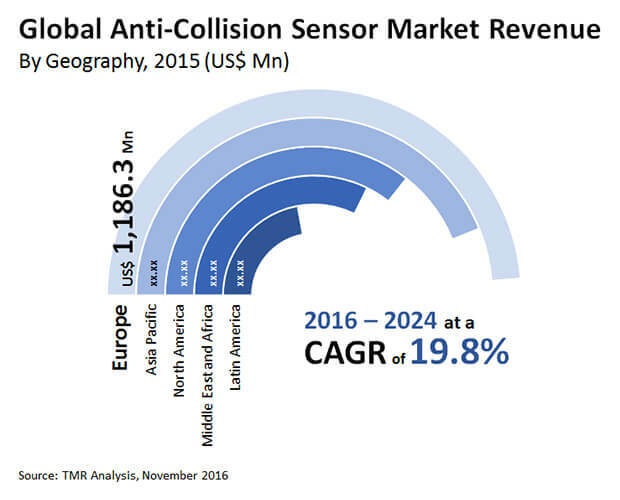 North America holds around 18% market share in global anti-collision sensor market. US, Canada and Mexico are some of the important nations that contribute to the growth of anti-collision sensor market. US is a major economy in driving the growth prospect of global anti-collision sensor market. Large number of US car manufacturing companies are installing anti-collision sensors in their cars. Due to the growing popularity of driverless cars, US car manufacturers adopting this design to sustain in competitive automobile market as their European counterparts. US regulation also stress on the need for anti-collision system in automobiles and that finally lead North American region as a major market for anti-collision sensors. The global anti-collision sensor market is segmented on the basis of technology into segments are radar, ultrasonic, lidar, and camera. Radar sensors is expected to hold the leading market share and it is likely to be a very swiftly-growing segment during the forecast period. Radar sensors can detect objects at longer distance and this sensor work with high speed and efficiency. This sensor is used in adaptive cruise control and forward collision warning system. Radar sensor in combination with camera sensor are expected to hold significant market share in anti-collision sensor market. On the other hand, ultrasonic sensors are of low price and that is expected to increase their usability as parking sensor. Leading market players in the global anti-collision sensor market so far, have been Robert Bosch GmbH (Germany), Continental AG (Germany), Denso Corporation (Japan), ZF Friedrichshafen (Germany), and Delphi Automotive (UK). As a safety measure, anti-collision sensors have quickly become an essential component in the automobiles, primarily utilizing radar and sometimes laser and camera to detect an imminent collisions. As the automotive industry touches new peaks, especially in the emerging economies, the demand in the global market for anti-collision sensor is anticipated to increase at a CAGR of 19.8% during the forecast period of 2016 to 2024. In terms of revenue, the global anti-collision sensor market had a valuation of US$4.36 bn in 2016, which is estimated to reach US$18.54 bn by 2024. This report on the global anti-collision sensor market aspires to serve as a credible business document for the audiences such as original equipment manufacturers, OEM technology solution providers, technology investors, and the suppliers and distributors of automotive components. The report contains an in-depth analysis of all the factors that may influence the demand in the near future, favorably or negatively, and profiles a number of key players in order to represent the nature of competitive landscape and latest strategic developments. Technology-wise, the global market for anti-collision sensor is segmented into LiDar, radar, ultrasonic, and camera, whereas application-wise, the report bifurcates the market into adaptive cruise control, lane department warning system, forward collision warning system, blind spot monitor, and parking sensor. By end-user, the market has been categorized into automobile, maritime, rail, aerospace and defense, and other industries. Geographically, the report studies the opportunities available for the market players in the regions of North America, the Middle East and Africa, Asia Pacific, Europe, and Latin America. The increasing number of vehicles across the world and incrementing percentage of vehicular accidents are two of the primary drivers of the global anti-collision sensor market. Research and development in this field has led to improved anti-collision technology, which is further augmenting the demand. Moreover, in North America, the implementation of new car assessment program (NCAP) has further fueled the demand. NCAP checks the safety standards of all new vehicles launched in a given territory. The trends of autonomous transportation system, rising application of UAV’s in scientific, agriculture, military, commercial, and recreation are some of the other factors propelling the demand in the global anti-collision sensor market. Conversely, high cost associated with these sensors is hindering the market from achieving its full potential, especially in the cost-effective regions of Asia Pacific. By technology, the segment of radar sensors holds the leading market share and is expected to remain most prominent thorough-out the forecast period as these sensors can detect objects at longer distance and works efficiently at high speeds. Moreover, radar sensors are cruise control adaptive. The segment of ultrasonic sensors, which are low cost, is gaining demand for their usefulness as parking sensor. Owing to the presence of several leading players of this market and stringent road safety regulations, the region of Europe is the most lucrative. North America is the second most profitable region in the global anti-collision sensor market, although vastly populated Asia Pacific region with rapid urbanization is expected to increase the demand at most robust rate during the forecast period. With strong distribution network, grasp over latest technology, and experience in the automotive industry, only a few of the leading companies dominate the market, including Continental A.G., Robert Bosch GmbH, ZF Friedrichshafen, and Denso Corporation. The dominance of these companies are expected to sustain through-out the forecast period.